The five contenders to replace Michael Howard as leader use their week in Blackpool to advance their cause - some with more success than others. Michael Howard calls on the party to unite and support his eventual successor, while not endorsing any individual candidate. Front runner David Davis hits back after criticism of his speech, insisting he is still in pole position as leader. David Cameron is finally proud to admit his links with Notting Hill, after telling a fringe meeting he does indeed live in the famous west London district. On Wednesday Liam Fox pledged to fix Britain's "broken society" and sends out a strong Eurosceptic message to supporters on the right of the party. Also on Wednesday front runner David Davis made his pitch for the Tory leadership telling the party to "walk tall" and stop apologising for its past. On Tuesday Ken Clarke told representatives he was a "bigger beast" than either Gordon Brown or Tony Blair and the Conservatives' best chance of winning the next election. Also on Tuesday David Cameron said he wanted to win over a new generation of Conservatives, to make "people to feel good about being Conservatives again". On Monday Sir Malcolm Rifkind was the first contender to address the conference, putting in a rousing speech in which he says the party must build on its One Nation traditions. Gloom abounds in the David Davis camp as they awake to devastating press headlines. Normally chipper chief of staff Iain Dale's face, as he strides through the conference centre, says it all. Ken Clarke supporter Anthony Steen wins the prize for the most quoted put-down of a rival contender, as his assessment of Mr Davis as "IDS with hair" circulates the press room. The Daily Telegraph executives' party proves to be a happy hunting ground for leadership candidate watchers, with David Cameron reportedly telling the gathering he was the natural heir to Tony Blair. Michael Howard is on his way out as Tory leader, but it still cost party representatives a tenner to join him and wife Sandra at a champagne reception. Aides say the event was "well-attended" - although drinks parties held by other leadership contenders have seen Tory members queuing out of the doors to get inside. Ken Clarke's story about the time he tried to introduce the young Howard to an exciting new pop sensation goes down well at the dinner. It turns out Mr Howard - ever the trendsetter even then - already had a Beatles record. What's the verdict of the conference speeches by the five leaderships rivals? The Daily Telegraph believes David Davis' lacklustre speech has left him battling to hold on to his advantage in the leadership race, saying his speech lacked empathy. The Times sketch writer Ann Treneman called his address a triumph of mediocrity and Simon Hoggart in The Guardian joined in, saying Mr Davis was "thunderously not too bad" and can now see his support gurgling away like water down a drain. The Daily Mail comments that while one flat speech will not decide the leadership election, it recalls how in 1963, Rab Butler lost his chance to succeed Harold Macmillan with one poor address to conference. 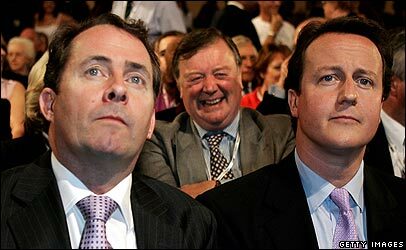 David (Cameron) made a good speech, Ken Clarke made a good speech, Malcolm Rifkind made a good speech. That is brilliant, you know, because one of the things that we've got to do in this party is raise our entire game, not just the leader and I am pleased about that. David Davis praises his rivals. We know we have to pick an even bigger beast than either of them to push Labour out of office. Ken Clarke on Gordon Brown and Tony Blair - and himself. "I think he (David Davis) must be very worried, because he was speaking to a party of Conservative enthusiasts who wanted to will him to succeed. Malcolm Rifkind discusses David Davis' speech.